The band started in summer of 2013, after the fall of Taylor Colo'n's first band, W.O.L.F. (Whine Or Live Fearlessly). During the three years of the group's consistent attempts to make it to the stage, Taylor fought hard to keep the expectations of the fans high. He always tried to tell people, "We need more time," but to no avail. In Spring 2013, the band's lead guitarist began experiencing serious downfalls. One after the other. Taylor was left with no choice. This time, there would be no way to bring W.O.L.F. back. The band deteriorated. In the Summer of 2013, Taylor began sitting down and re-recording the planned EP of W.O.L.F. "Thrash and Burn", which would be Wolf in Vain's first musical release. "I had nowhere to go. Sure, my production company was starting to boom, but I'm not the office type. There's only so much time I can spend in there. I love art, yeah, and that's what I mainly do there, but thrash metal is where my heart lies. Now that the company is getting somewhere, I feel great, and I think W.I.V. will prosper, too." 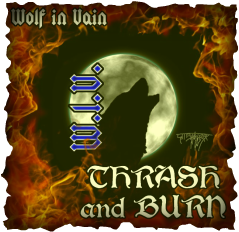 Wolf In Vain finished recording their debut EP, "Thrash and Burn". The cover was exactly as W.O.L.F. 's version, though the logo was modified to read "W.I.V. ", rather than "W.O.L.F." Taylor had envisioned his previous band to have duel solos going on, and while "Thrash and Burn" does not feature this, he managed to pave a new road. Rather than previous releases in which he was solely rhythm (the only exception was the solo on "The Killer" by W.O.L.F. ), Taylor composed and played all four of the main solos. "War Strained" contains a quick pick-tap solo on the bridge. This is the only lead guitar work written by Taylor's previous band mate, who is given credit on two of the EP's tracks. The pick-tap solo in "War Strained", as well as the entire intro of the title track, "Thrash and Burn...Until We Die". The lyrics discussed a wide range of topics. "Wild Fire" goes on about schizophrenia, hatred for the world, as well as the never ceasing fire burning inside one's self. The song is written, however, to be interpreted in several different ways. "Berzerker" is about a murderous psycho. "War Strained" goes on about the straining times of war and the pain it inflicts on people. Finally, "Thrash and Burn...Until We Die" is a two-song track, going on about the new thrash revolution, and the clean section of the song is a farewell as the protagonists venture "into the darkness" to start that revolution. Sadly, the drummer that worked with Taylor quit after the recording sessions, asking to remain anonymous. Wolf In Vain only had it's frontman on vocals and lead guitar for a while. But, regardless, Taylor strived to find the perfect band mates. While he was pressured with the band's debut show coming up, he managed to find exactly what he needed. A skeleton crew, but nevertheless, a band. While there were many irritations and technical difficulties releasing the EP, "Thrash and Burn" marked the start of a new legacy. The EP was released August 24, 2013 on iTunes, followed by other retailers in the following weeks. After the EP was released, Taylor set his stage name as "Tab" short for "Thrash and Burn". But as he prepped for the stage, the new members dropped. Nearly a year would go by before the band would hit the stage again. But Tab ran into drummer Todd Conrad during those dark months. The two ended bonding musically. A riff played on the guitar was immediately met with a new drum riff. The duo could easily match and write out songs. 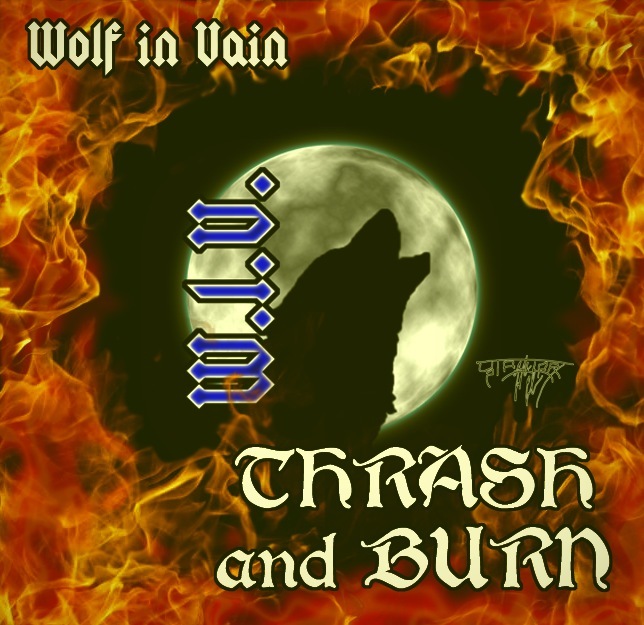 Even though Wolf In Vain was only a two piece band, they began doing shows in August 2014. As an opening band, they knew not to expect applause. But they soon learned that whatever small crowd there was, they were moved.